MOJAVE, Calif. — Commercial astronaut Brian Binnie, who piloted the suborbital SpaceShipOne on a famous $10-million prize-winning flight nearly a decade ago, has been named XCOR Aerospace's senior test pilot. "I'm very pleased to be part of the XCOR team and look forward to working with friends and colleagues on many of the exciting development efforts at XCOR, including the family of Lynx vehicles," Binnie said in a statement released by the company April 3. "I look forward to seeing the Lynx flying soon and making a contribution to the program." An artist's illustration of the Lynx space plane built by XCOR Aerospace of Mojave, Calif. In his new job, Binnie will work with XCOR chief test pilot Rick Searfoss on flight tests of the company's two-seat suborbital Lynx space vehicle. "Brian and I have been friends and colleagues for many years, and I have always wanted to work together in a flying environment," Searfoss said in a statement. "Combining our backgrounds as government and commercial astronauts and our broad experience across a number of rocket-powered craft, I feel this builds on XCOR's strong culture that emphasizes safety and professionalism." Engineers are currently assembling the first Lynx vehicle in XCOR's hangar in Mojave, with initial flight tests tenatively scheduled for later this year. Binnie's addition to the team will allow the company to accelerate flight test planning, said Chief Operating Officer Andrew Nelson. "The combination of Rick Searfoss and Brian Binnie at XCOR is a powerful statement from the professional flight test community about XCOR and the Lynx," Nelson said. "The pairing of two [people who are] decorated military test pilots, rocket-powered aircraft pilots and astronauts is a powerful team that defines XCOR as a leader in the industry. "XCOR's vehicle integration efforts are ramping up with major subassemblies arriving daily, the propulsion system nearing final development tests in a closed thermodynamic cycle and avionics being populated on the cockpit panel in the avionics lab. Landing gear tests have also been successfully performed," he added. An artist's depiction of XCOR Aerospace's suborbital Lynx spacecraft. Jeff Greason, CEO of XCOR, and Dan DeLong, the company's chief engineer, worked closely with Binnie in the late 1990s at Rotary Rocket, a now-defunct Mojave company that was developing a reusable space vehicle. Greason and DeLong left the company to co-found XCOR with two other Rotary veterans, while Binnie went to work for Scaled Composites. "He was a consummate professional and leader [at Rotary], and we've stayed in close contact over the years, so I know he will make a great contribution to our efforts at XCOR and getting the Lynx flying soon," Greason said. 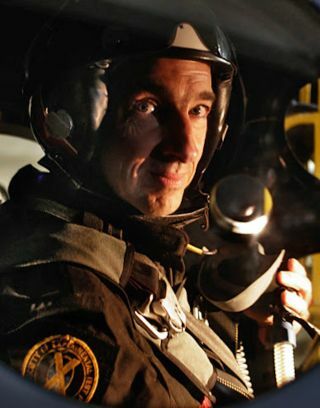 While at Scaled Composites, Binnie made history on Oct. 4, 2004, by piloting SpaceShipOne on the second of two flights that won the Ansari X Prize — a $10 million purse offered by the X PRIZE Foundation to the first privately built manned space vehicle that could reach space twice within a two-week period. Test pilot Mike Melvill had made the first flight five days earlier. Binnie is a decorated former Navy aviator and test pilot with more than 5,300 hours of flight time in 85 different aircraft over 29 years. He has flown the A-7 Corsair, A-6 Intruder, F/A-18 Hornet and AV-8B Harrier.